A woman who came to Canada from the Philippines as a live-in caregiver has been jailed for exploiting would-be immigrants in a stiff sentence designed to thwart a wave of bogus immigration consulting. “She lied to them, cheated them, and, in some cases, even threatened them. By doing so, not only did she harm the very vulnerable people who she promised to help, she also repeatedly subverted the integrity of Canada’s immigration system,” said Judge James Stribopoulos of the Ontario Court of Justice when sentencing Eliza Lazaro to 11 months in custody. She was also ordered to pay $23,500 in restitution to her victims. Lazaro posed as an immigration consultant who could find employment and handle paperwork for would-be immigrants. Instead, she forged paperwork to create make-believe employers for upfront fees that allowed the women and one man to obtain visas to Canada. Judge Stribopoulos noted that Lazaro was in a special position to sympathize with the migrants and their desire to start a new life in Canada because their circumstances so closely mirrored her own. Instead she preyed on them and victimized them. She arrived in Canada in 1990 at the age of 24 as a live-in caregiver from the Philippines. After three years at that job she moved on to other employment, including selling insurance. In 2008 she began offering services as an immigration consultant but was never licensed to do this work with the Immigration Consultants of Canada Regulatory Council. Several of her clients arrived in Canada only to find their promised job was a lie and their paperwork forged or falsified. One woman from the Philippines paid her $5,000 to come to Canada on the government’s Live-In Caregiver Program. When she arrived, the woman who was supposedly hiring her had no need of a caregiver. The fake employer later told investigators she was paid $500 by Lazaro to pose as an employer for the application. A man arrived in Canada after paying Lazaro $4,500 but when he went to the address of his so-called employer to start work he learned it was all a ruse. Another migrant paid $5,000 and was given fake employer information. She was stopped at the border and deported. Lazaro told a woman from Hong Kong that her purported employer was away on vacation when she arrived; several months later she had still not been able to make contact. 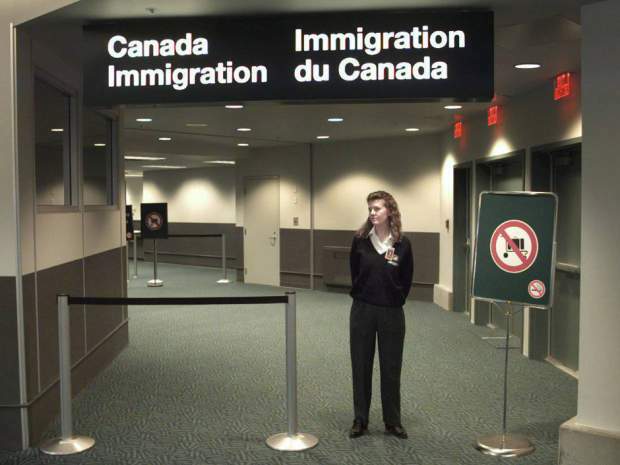 The worker eventually found another job and remained in Canada but, two years later, Lazaro sent her a text saying she would “send her back” if she didn’t pay her more money. The worker ignored the demand. One woman gave Lazaro $10,000 to bring her two nieces to Canada as worm pickers but Lazaro did nothing to help them. Because the woman who hired her lived in Canada she was able to sue her to recover her money, but her nieces were out of luck. A woman from Saudi Arabia paid Lazaro $4,500 but when she arrived she found no job waiting. Instead, she learned, her purported employer was actually Lazaro’s husband posing as an employer. Another woman from Saudi Arabia sought original copies of immigration documents Lazaro emailed her but was refused. She demanded a refund of her $2,500 but Lazaro threatened to have her banned from Canada if she pressed the matter. The woman never made it to Canada. After five-year span of duplicity she was arrested last year and recently pleaded guilty to seven counts of violating the Immigration and Refugee Protection Act. Lazaro had no criminal record and paid $20,000 in her lawyer’s trust account to make restitution before her sentencing last month. The judge also noted that her victims were legitimate migrants, not willing schemers like in several cases of bogus immigration. “Those who come to Canada through the Live-In Caregiver Program are an especially vulnerable group of newcomers,” Stribopoulos said in his ruling. Lazaro’s sentencing hearing highlighted a rash of recent cases of bogus immigration consultants. Sergio Karas, a Toronto immigration lawyer and past chairman of the Ontario Bar Association’s Citizenship and Immigration Section, said the cases are piling up. “This problem appears to be widespread in many communities, where unscrupulous individuals use their connections to dupe others,” said Karas. “It is appalling how a person who came to Canada as a caregiver and was probably familiar with the mental anguish that her co-nationals must have felt, chose to take full advantage of them through threats and intimidation,” said Karas.